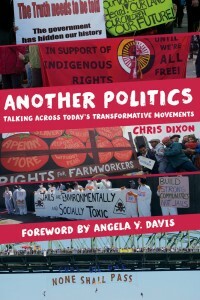 When I read Chris Dixon’s Another Politics, I realized that he had staged, recorded, and analyzed many more insightful conversations with contemporary radical activists than I could have imagined. This book not only allows the reader to feel a part of these conversations about radical movements of today, it also helps us to identify key points of convergence and possible future directions for social justice movements in our part of the world. Another Politics: Talking Across Today’s Transformative Movements engages the anti-authoritarian current, a political tendency including abolitionists, anarchists, anti-racist feminists, autonomists, and many other radicals. Cutting across a wide range of left social movements in North America, this current is distinguished by its commitment to directly democratic structures, anti-oppression politics, explicit organization-building, prefigurative political practices, working for reforms while also pursuing revolution, and grassroots organizing. In a time of daunting crises, the anti-authoritarian current offers crucial lessons and strategies for social transformation. As Another Politics documents, the anti-authoritarian current has emerged out of the fascinating convergence of a variety of radical politics and broader-based movements in recent decades. From this convergence, a growing set of dynamic and dedicated activists – from anti-poverty organizers in Toronto to prison abolitionists in Oakland, from occupy activists in New York to migrant justice organizers in Vancouver – are developing shared politics, practices, and sensibilities based in overlapping areas of work. They are building “another politics,” to use an expression from the Zapatista rebels in Mexico that has become increasingly popular north of the border. Another Politics draws on dozens of interviews with experienced organizers across the U.S. and Canada. It traces the strands of movement and struggle that have led into the anti-authoritarian current, explores the defining principles and practices of another politics, and examines the visionary political approaches and questions that are emerging from the activities of this current. Building on collective reflections, this book also distills hard-earned lessons concerning anti-oppression politics, prefigurative praxis, strategy, organizing, leadership, and organization. Buy Another Politics at your local independent bookstore or online here.